While an actual mechanical "space elevator" is still only a theoretical idea buzzing around in the eggheads of NASA, Space Elevator, England's latest musical wunderkind, is a present and pleasing reality. 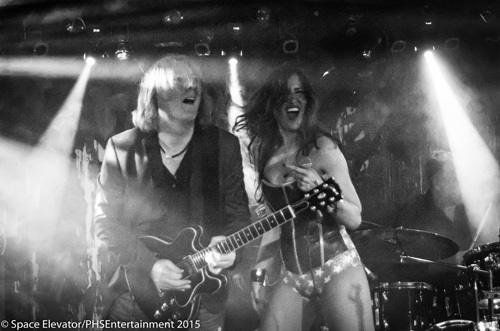 Space Elevator is a musical powerhouse creating classic AOR melodic rock, featuring the "chills down your spine" vocals of The Duchess. Their self-titled first album, self-released more than two years, is getting the push again as the band embarks upon a Spring tour of Europe and the UK. There's everything to like about this band and their music. Solid musicianship from industry veterans. Superb songwriting creating lasting melodies, smooth groove, and catchy ear tingling songs. An abundance of energy, enthusiasm, and charisma drips like honey from the same. The Duchess' vocals are more than amazing. She's likely one of the best female rock vocalists I've heard in a long, long time. Her name can and will be mentioned in the same company as Robin Beck, Kate Bush, Ann Wilson, among others. All this adds up to a solid depth and breadth to the songs, so let's hit some highlights. Elevator, the lively start, reminds of a pop song composed for the dance floor, but still struts with the bravado of a rock song, while having a vocal and piano breakdown in the middle. Loneliness Of Love sounds like something right out of late Seventies, early Eighties, AOR melodic rock where melody and harmony, beat and groove, propelled things with toe-tapping enthusiasm. A pure catchy radio-friendly anthem comes with Ordinary Day, where within the groove is embellished with an infectious melody and memorable refrain. While The Duchess inspires throughout, within Oils And Bubbles she seems sultry like a torch singer, within Really Don't Care, she gets her blues groove on for another damn fine catchy song. Nice ballads, inspirational and soaring, come with We Are The Losers and I Will Find You, where The Duchess's voice will give you goosebumps. That's just a taste of a few songs. Some mention should be made of the crisp and lively piano presence of many songs and, for the hard rock purists, there's an abundance of soaring guitar solos. There's no quibbling. The whole album is terrific, pretty fandamntastic. Easily one of the best AOR melodic rock albums I've heard this year. Get it. Easily recommended. 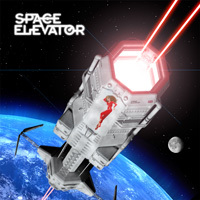 Space Elevator's debut album is terrific, pretty fandamntastic. Easily one of the best AOR melodic rock albums I've heard this year. Get it. Easily recommended.